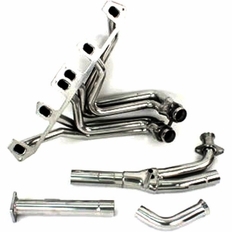 Pacesetter Headers are the perfect solution for your vehicle. Whether you simply need to replace a cracked/rusted exhaust manifold, getting your truck race ready, or you�re just looking for extra horsepower and torque, Pacesetter Headers will get your vehicle breathing better! Pacesetter Headers are manufactured in the USA using mandrel-bent, mild steel tubing and surface-ground, thick steel flanges to resist warping and increase lifespan. Pacesetter Armor Coated headers are the same performance headers you've come to expect from Pacesetter, but with one big difference. The Pacesetter Armor Coat is a polished metallic / ceramic finish that reduces underhood temperatures, resists rust and corrosion, and looks great. Armor Coat Headers by Pacesetter are guaranteed to not chip, peel or flake for three years. Each Armor Coated header undergoes an extensive preparation phase followed by two applications of the Pacesetter Armor coating and a high-temp curing process. This results in a 2000 degree continuous heat rating that is perfect for racing and high performance applications. A 3 Year Pacesetter Performance Guarantee / Warranty. The part number for this item is: 72C1128 and it fits 1987-1990 Jeep Wrangler 4.2 models. This Pacesetter Header is legal for street use in all 50 states, including California. If a technician questions the legality of this item during a vehicle inspection or smog check, simply provide them with the CARB Exemption Number for this item, which is D-439-2 and D-439-5.